After reading your recently published Grub Street interview as well as your motion, I decided to write this follow-up letter. To begin with, I’m not in anyway aligned with the “meat industry” or right wing radio. Your dismissing objections to your motion as such honestly is somewhat offensive. I’m also not a libertarian, but I simply believe that in the case of menu decisions, operators- rather than regulators- should be the ones making the decisions as to what they serve or don’t serve based upon market demand rather than additional regulations. That was the entire point of my prior sardonic letter to you. As someone who has been a consultant to the food service industry for a very long time, I’ve made a concerted effort to understand how ALL of the food I eat is raised, grown or caught. This has led to my visiting numerous farms, ranches and fisheries. Food production is not a simple dichotomy of “plants good” and “meats bad.” There’s an whole array of ways to raise, grow or catch food that range from very bad to very good. Many forms of plant production are horrific for the environment and especially for soil health. Tillage, for example, destroys soil ecosystems and releases soil carbon into the atmosphere. According to Nobel Prize winning soil scientist Rattan Lal, as he explains in the video below, a third of the atmosphere’s current carbon is due to the plow not cattle or automobiles. Sadly, many of your comments in your Grub Street interview and your motion reflect a very shallow understanding of food production and climate science. Your interview and motion also uncritically accepts a report from a vegan author (Poore) at Oxford as authoritative. It’s not. Let’s look at that Oxford study by Poore and Nemeck. Per the methodology as noted in the summary, it’s a meta-analysis of life-cycle analysis [LCA] for greenhouse gases emitted from different types of foods for studies conducted from 2000 to 2016. (Meta-analysis is based on using key-word searches to find prior relevant research papers meeting the criteria of the researchers. So it’s a study of prior studies. A life cycle analysis is a systems view of all water, green houses gases, etc to produce a product during a phase or the entirety of production). For an LCA to be included in Poore’s paper, the LCA had to be inclusive meaning through all phases of production, which for beef means from conception on a cow-calf operation to finishing at a feedlot all the way through processing to purchase at a butcher or grocery store. In Poore’s paper, the data from the LCA’s were standardized and averaged with ranges of variation provided. Or, in other words, your comments on green house gases in your motion and Grub Street interview about the “lowest impact” beef are simply wrong. As for land use, since you like referring to the UN so much, you should also read the latest UN FAO report on feed (Mottet et al. 2017). In this report, the authors note how most of the land used for agriculture is NOT suitable for crop production, including legumes. So the only way you get food off the land is through grazing. Ruminant up cycle inedible to human food stuffs into nutrient dense foods. Poore’s Oxford meta-analysis included very few studies from Africa. Most were from Europe. In Africa on average, only five percent of the land is arable. Even in California, the only way so much specialty crop production is possible with higher yields is through massive amounts of irrigation (blue water). Most people point to water footprints without understanding how such numbers are derived. Grass fed and grass finished cattle can eat grasses that use only “green” water. For grass fed and finished beef, 97% of the water required is “green” water. What’s green water? Rain. Blue water is what’s critical. In the Central Valley, we’re pumping ancient aquifers dry for almonds to export, and almond milk not for grass finished beef. Grazing beef cattle, when managed properly, actually improve drought resilience because they improve soil health through carbon sequestration. More carbon in the soil increases the water holding capacity of soil BIGLY. Drought is as much a function of the amount of water that infiltrates and is retained by soils rather than simply a function of how much rain falls from the sky. Please read my blog entry Understanding water footprint numbers. So what does Poore’s paper suggest as a solution in its summary? Even greater reliance on industrial agriculture with more intensive use of synthetic fertilizers. Poore’s a zoologist, not a farmer or soil scientist. So not only is his solution not sustainable as the Sustainable Food Trust points out in their reply, Claims against meat fail to consider bigger picture, but such a solution perpetuates and exacerbates the underlying problems with how so much human and animal food is produced nowadays including most organic agricultural. Tillage, bare fallows, monocrops, chemical inputs (synthetic fertilizers and pesticides) all destroy soil and soil health, and soil health is pretty much the key to everything. We’re rapidly losing top soil. According to some at the UN, we only have 40 to 60 harvests left. When all the top soil is gone, it really won’t matter what dietary pattern your children and their children follow because they’re all going to be screwed. Livestock, especially ruminants, are essential tools in rebuilding soils and soil health. Please read this article, Beyond Wetiko Agriculture: Saving Ourselves from the Soil Up, by my friend Tom Newmark, Chairman of the Greenpeace Fund USA. Please also read this article, Healthy soil is the real key to feeding the world, by Dr. David R. Montgomery. Though Poore’s paper wasn’t, you should also realize that a lot of the recent research being done at Oxford’s Programme on the Future of Food is funded through the EAT Foundation. The EAT Foundation is part of the FReSH initiative, a global business partnership including companies like BASF, Unilever, Nestle, Cargill, etc all heavily invested in the destructive status quo especially monocropped industrial agriculture. So it’s really no wonder why Poore’s summary proposes more industrial agricultural as a solution while pointing the finger at animal agricultural as the sole problem. Sure factory farming is horrific, but there are plenty of alternatives especially regenerative ones. to raise livestock that are environmentally beneficial. Plus the key point to remember is that industrial agriculture begot factory farming since feedlots and CAFO’s were a way to use the by-products of the seed and soy bean oil crushing industry. Let’s break this down specifically for beef. There are globally approx 1.5 bill head of beef cattle. In Brazil’s Amazon, there are approximately 80 million head of beef cattle, so that approximately 5.33% of global beef cattle inventory. No amount of beef should be produced in tropical forests, and the vast majority of beef cattle isn’t raised in such places. The vast majority of beef cattle is raised in grassland ecosystems that beef cattle help to preserve. (If you were a true environmentalist, you’d be equally concerned with the loss of grasslands that are being destroyed faster than rain forests). That’s true even in the US with the highest feedlot capacity. Most (82%) beef cattle inventory is on cow-calf and stocker operations not in feedlots. Feedlots are primarily for finishing, and even there what’s fed to cattle is primarily food waste and crop residues. Even a lot of the corn starch now fed is a by-product/co-product, DDG, from the ethanol industry. Beef cattle aren’t fed much soy since soy is a lot more expensive. Pretty much all soy is pressed for oil for human consumption and uses. Per FAOSTAT figures, a typical US citizen gets around 25% of his daily calories from seed and soy bean oil with most coming from soy bean oil. The left over soy meal is used for a lot of different uses including animal feed and pet food, but the livestock that get this feed are primarily chickens and pigs in CAFO’s not beef cattle in feedlots. Chickens also account for the vast majority of killed livestock in the US and globally. In the US in 2014 of the 9.2 billion land animals slaughtered, 8.8 billion were chickens. So, no offense, your reducitarian diet is pretty dumb. You reduced the wrong meats. In Brazil most of the soy meal left over after crushing goes to Brazil’s HUGE chicken industry or shipped to its largest financier China where much of the meal is fed to pigs. Brazil by weight produces about 25% more chicken than beef. About 70% of Brazil’s soy is exported to China. China has been funding a lot of the large infrastructure projects in Brazil including new roadways and hydroelectric dams. 80% of all deforestation in Brazil occurs within 30 miles of new roadways because a lot of land grabbing is done for reasons of land speculation. Deforested land is worth 100 to 200 times more than land with forest on it. Deforested land is also not very fertile. The soils are acidic (oxalic) thus they have to be treated with lime to raise the pH and treated with a lot of phosphorus to be fertile enough for crops or seeded pasture. Monocropped soy is a phosphorus dependent crop. So without agrochemicals, conversion of forest to seeded pasture or crop land would be a lot more difficult as well as a lot less lucrative. Deforestation, in general, is a very complex dynamic especially in Brazil. A good book ,Amazon Besieged by dams, soya, agribusiness and land-grabbing, I just finished reading deals with this complexity. I suggest you pick up a copy before parroting more talking points. The vegan propaganda you repeated tends to grossly oversimplify. Sadly, the mindset among many leaders in Brazil is that they have the right to exploit their resources just like the United States and Europe did when these countries built their wealth. So it’s a gold rush mentality where environmental laws aren’t enforced, environmental agencies aren’t sufficiently funded, and criminals are not penalized. Thus land set aside for protection or indigenous people is used for illegal timer, mining, farming and ranching. For every and any new law created, there are a myriad of ways to circumvent those laws. Until you change the mindset and profit incentives, especially of a global marketplace, you won’t drastically reduce deforestation whether you eat meat or don’t eat meat. The same widespread corruption and incentives are also pervasive in Malaysia and Indochina where the main driver for deforestation is palm oil not livestock. Now as for the second part of your comment about [enteric] methane [from cattle] causing so much of the problem, I addressed that cursorily above and referred you to my blog entry I wrote about methane math and context. But let me just elaborate some.for added emphasis. The whole notion of enteric methane emissions (“cow’ burps) being a driver of climate change actually emanated from the industrial beef sector as a rational for feedlots. The simple math was the shorter a head of cattle lives the less methane it can emit, thus getting cattle to harvest weight faster the better including through feedlots, genetic engineering, growth hormones, etc. The problem with such analysis is that cattle aren’t tail pipes, they evolved and live in a context with multiple sources of methane emissions and sinks. (Remember too, the whole point of Long Shadow’s authors was that greater intensification of livestock production was needed to mitigate livestock’s “long shadow.” Intensification in this context means factory farming instead of small holders and extensive (pasture) based systems). Sinks offset sources of emissions. Methane is generated in cattle rumen by a process called methanogenesis. This occurs when archae, methanogens, convert the stored CO2 in cellulose or grasses that cattle and other doemstic and wild ruminants eat with H2 to form short chained fatty acids [SCFA] and methane. The cattle get their nourishment from the SCFA’s and burp the CH4. Methanogens occur in a lot of other places as well so there are a lot of sources of “biogenic” or microbial methane emissions including wetlands, rice patties, manure, termites, arthopods, shellfish, landfills, etc. 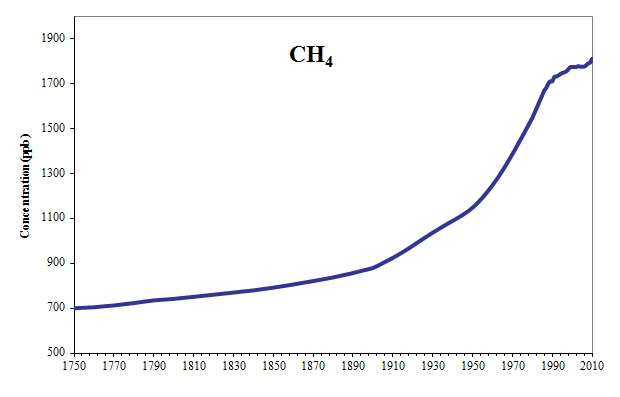 The thing is though for millions of years, atmospheric methane levels stayed constant from biogenic emisisons that is up until the industrial revolution when they started to rise due to trapped ancient forms of methane being released into the atmosphere. These “thermogenic” forms of methane were of course from fossil fuels. Fossil fuels are not only the largest source of carbon dioxide, they are also the largest source of methane as well. When ancient forms of methane are released, the sources of emissions exceed the capacity of the sinks to offset those emissions. The primary sink for methane is the troposphere hydroxyl radical sink. Hydroxyl radicals collide with methane, including enteric methane, and steal a hydrogen atom, thus CH4 is broken down to water and ultimately CO2 which becomes part of the carbon cycle. Given that California is still only getting 22% of its electricity from wind and solar as well as how much natural gas restaurants use, if you were a true environmentalist and actually progressive, you’d be finding ways to provide incentives for food service locations to switch over to induction cook tops powered by green electricity. This could be expanded to incentivizing solar arrays on flat roofs throughout the county and giving tax credits to better battery companies to locate in the region. Sadly, by being a tool of vegan groups, all you’re doing is promulgating a lot of half truths plus some blatant falsehoods and propaganda pushed by animal right advocates masquerading as environmentalists. So rather than coming up with meaningful solutions, all you’re doing is imposing regulatory nonsense that doesn’t address the real problems with climate change or food production. That’s truly very unfortunate. You shouldn’t legislate things you don’t really or fully understand. This is also why I’m “post vegan” because veganism isn’t a real solution. it’s just an emotional response that’s morphed into a religion based on a lot of mythology. If you or any of the other council members copied on this email would like to discuss this further, please don’t hesitate to contact me. If this is true then why is the majority of beef on the market from CAFO’s and not pastured? The numbers add up when you understand how beef cattle production is done in different countries. Let’s look at the United States, since the US has the greatest feedlot capacity of 16 million head. Of that capacity, per the USDA stats, approx 14 million of that max is being utilized at any moment in time. So where are the other 68 million head of beef cattle inventory in the US? These animals (cows, calfs, bulls replacement heifers and stockers) are on either cow-calf or stocker operations outdoors on grass. Many of these operations are in states that contain grasslands or once were entirely grasslands. Beef cattle is a lot different than conventional pork or chicken production. With CAFO pigs and chickens, this livestock goes from insemination to cellophane without ever being on pasture. This is what’s known as “verticalization.” Pigs and chickens are monogastric meaning they only have one stomach chamber so they can eat primarily grains and soy meal. Most soy meal is fed to chickens (broilers and laying hens). Beef cattle in the US is not vertical. Calves are born on cow calf operatios, then are ran on stocker operations, and then “finished” either on grasses or “grains”. Grass finished cattle stay on the land. “Grain” finished end up in feedlots for (typically) the last 4 to 6 months of their lives. Currently grass finishing is only approximately 6 to 7 % of finishing, but that number was only 1% about 5 or so years back. Countries like New Zealand, Australia, and Brazil are around 98% grass finished. In many European countries, the beef cattle is often unwanted steers from the dairy sector. So different countries have different production methods. Note I put grain in quotes for a reason, since cattle when transferred to feedlots have to be transitioned from grasses to grains gradually since cattle did not evolve to eat grains. Too much grain causes bloat, acidosis, ulcers, etc. So cattle in feedlots eat primarily roughages before being fed primarily grains at the very end of their lives before being slaughtered. Many urban types only see feedlots either like Harris Ranch near I-5 or in videos, but these are only a small portion and the end of production with conventionally finished cattle. Most urban types don’t realize that most of the cattle is on small family owned operations on land that isn’t suitable for crop production. What a wonderfully well informed and authoritative post (letter). The question of course is…. what response have you received from Counsellor Koretz? Previous Previous post: Why do only some diets warrant special laws?